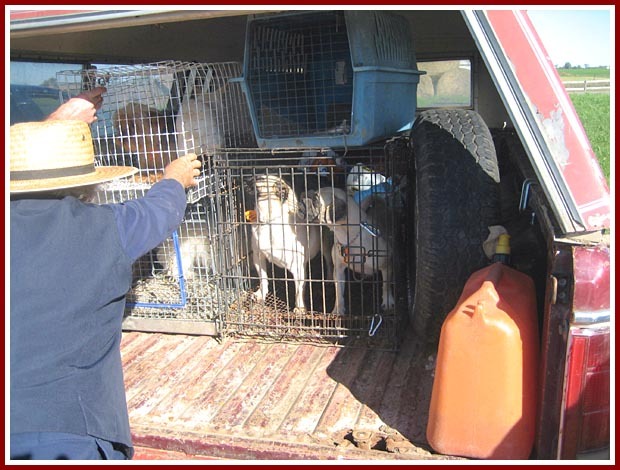 After the Thorp dog auction on 22 September 07, this Mennonite "puppy farmer" wedged crates and cages containing his purchases into the back of his vehicle, between the spare tire and the extra gas can. Some of the crates contained as many as four dogs. This gentleman said that he lets his dogs breed "whenever they want to because that's nature." These animals are being transported from one puppy mill to another. They will never have a "normal" life, never have good food, a cozy bed, fresh water, the touch of a friendly hand. They may never even hear a kind word. Guide to Finding a Pet * Breeders With Pride * Rehoming: Free To Good Home?